The paper finds that discrimination against women in accessing resources bears a significant relationship with agricultural production and food security. 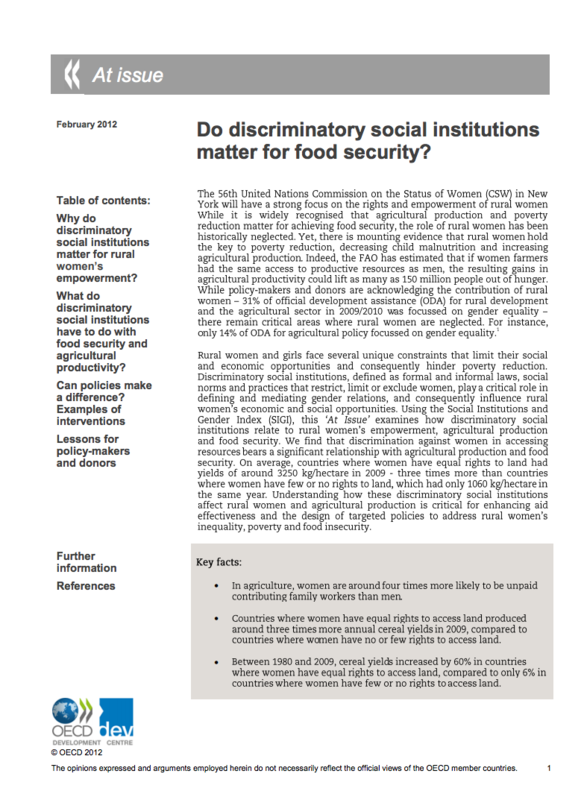 Understanding how these discriminatory social institutions affect rural women and agricultural production is critical for enhancing aid effectiveness and the design of targeted policies to address rural women’s inequality, poverty and food insecurity. The paper uses the 2009 Social Institutions and Gender Index (SIGI) to highlight the linages between discrimination against women in accessing resources and agricultural production and food sedcurity. The SIGI helps to improve our understanding of what drives gender inequalities in education, employment, political participation, to make visible the invisible; it informs effective policies to tackle the power relations at the heart of gender inequality; enables comparisons across countries and regions; and tracks changes over time to assess what drives change. Learn more about the 2009 2009 Social Institutions and Gender Index.